Made from buckwheat flour, soba is a traditional noodle dish in Japan and is considered to represent Japanese cuisine along with sushi and tempura. Soba is served in a hot soup, or is cooled and served on a strainer along with dipping sauce. Simple cold soba menus include zarusoba (with nori seaweed topping) and morisoba (without nori topping). Soba is a very common menu Japanese people regularly eat and is available at various types of eateries, from specialty restaurants to tachigui (stand-and-eat) shop. Soba cup noodles are also popular to eat at home, as it is ready within a few minutes after pouring hot water. Chopped negi onion is a common condiment that accompanies both hot and cold soba noodles. To add a spice, hot soba is served with shichimi togarashi (hot pepper sprinkles) while cold soba comes with wasabi. At many soba restaurants, servers bring a pot of sobayu to the table when customers finish eating cold soba, such as morisoba or zarusoba. Sobayu is cooking water from boiling noodles and is added to a dipping sauce cup to thin down the sauce for enjoying the flavor of soba until the last drop. Although making noises while eating is generally considered a bad manner at the table, soba and udon noodles are an exception in Japan, and it has been customary to slurp up the noodles to eat. 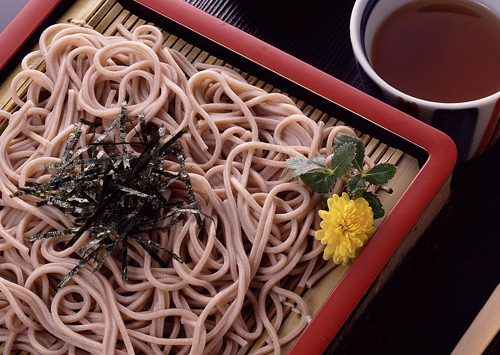 It is said that soba tastes better because a flow of air is created when slurping to bring aroma of soba to the mouth. Chinese noodles were introduced to Japan and developed in its own unique way to become today's Japanese ramen noodles. Ramen is one of Japan's national foods and is very popular throughout the nation. Hiyashi-chuka is a Japanese original version of cold Chinese noodles served with special sauce. A typical hiyashi-chuka is topped with such ingredients as cut vegetables, ham strips, and strips of thin omelet. It is one of the standard menus in summer. Udon is thick, white wheat noodles and is made by adding a bit of salt water to the flour, kneading the dough, and shaping it into noodle strips. It is served with bonito dashi stock and shoyu, or with dipping sauce. Sanuki udon is well known for its taste as a specialty food from Kagawa Prefecture. Somen noodles are very thin (less than 1 mm in diameter) white wheat noodles. Typically, boiled somen is rinsed in cold water and is served cold with chilled dipping sauce. Its smooth texture also makes somen a popular menu during the summer. Yakisoba originated from Chinese chow mein, which is a salt-flavored stir-fried noodle dish, and developed in a unique way in Japan. Today, typical yakisoba uses yellowish noodles and sweet and spicy sauce, and is a popular dish for a wide range of generations. Naporitan is an Italian-inspired Japanese pasta dish. Spaghetti is cooked with onion, green pepper, bacon, and other ingredients and is seasoned with ketchup. It is said that the first Naporitan pasta was created by a chef at a hotel in Yokohama who was inspired by a military ration for American soldiers. The history of growing soba (buckwheat) goes back to ancient times, to the Jomon period in Japan. During the Kamakura period, a grinder was introduced from China and made it easy to produce soba flour. While soba has been regularly eaten since then, the method of making soba into noodles (sobakiri), which are the most common form of soba dish today, is said to have been invented during the late 16th through early 17th centuries. According to records, a number of soba street stands were open at night in addition to soba restaurants during the Edo period. 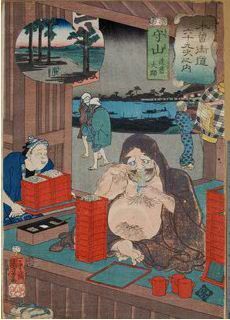 People of Edo were particular about how to eat soba for enjoying its natural flavor. Dipping only tips of cold soba noodles in a sauce, and swallowing rather than chewing the noodles once putting them in a mouth, are among such eating manners that were considered iki (sophisticated, stylish). Soba became an important dish in the lifestyle of people in Edo and began to be served to mark some significant events in lives of Japanese people. Hikkosi-soba was often given to neighbors when moving into a new neighborhood. Toshikoshi-soba is still commonly eaten today on the last day of the year (omisoka) to accompany one's wish for a healthy and long life.